The mission of the North Carolina Community AIDS Fund (NCCAF) is to empower communities to lead the response to the HIV epidemic by increasing individual, community, and statewide capacity to bring an end to HIV in North Carolina. NCCAF is a collective that brings together funders from across the state to develop a new type of collaboration that willl support HIV programs in North Carolina. The collective acknowledges that a statewide approach to HIV will increase the capacity of communities to serve and improve the health of peopling living with, and at risk of contracting HIV across North Carolina. Please Join Us for the 4th Annual NC Red Ribbon Community Service Awards & Gala! 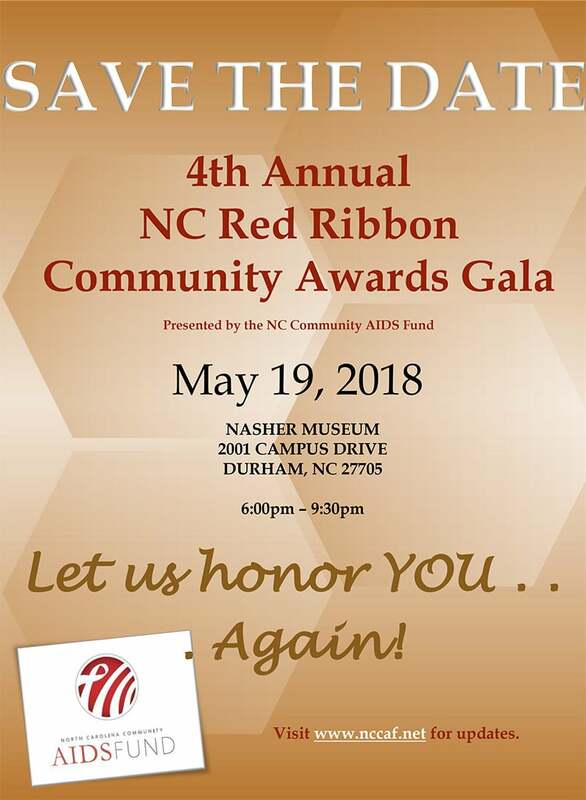 We are pleased to announce that NCCAF’s 4th Red Ribbon Service Award Gala will be held on May 19th at the Nasher Museum at Duke University. This gala serves to honor the excellence and dedication of people who serve the clients affected by HIV/AIDS in local communities across the state of North Carolina. People to be considered for the awards are submitted by the leadership in their area, a panel of NCCAF friends select the nominees, and the community is encouraged to participate in the selecting the winning nominee via online ballot. Everyone involved in the process is encouraged to attend the event which is FREE! We just ask that you register as the event space is limited. The success of this event will be credited largely to our sponsors, who lend their names and financial support. The money we raise each year goes to supporting HIV-related service activities across the state of North Carolina and defray the cost of the award ceremony. This year’s goal is $30,000. There are a wide range of sponsorship levels from $250 to $10,000, and you can also make a donation of any amount. As a sponsor, you or your organization will benefit from extended exposure through media campaigns and promotional efforts directed toward the supporters of NCCAF. Your donation will enable you to enjoy exceptional exposure to an important segment of your target audience and moreover be seen as a leader in helping HIV/AIDS service programs throughout the state. Save the Date for the 4th Annual NC Red Ribbon Community Awards Gala! 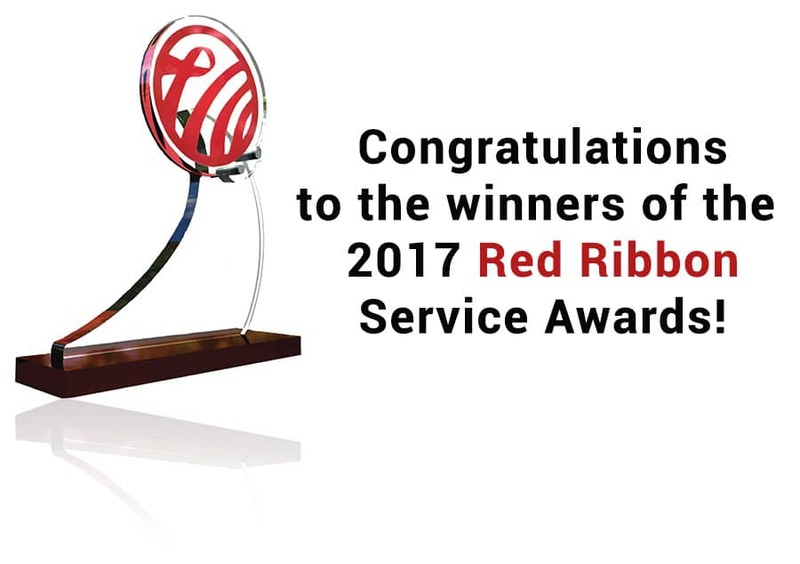 Check out the list of the 2017 winners of the Red Ribbon Service Awards! Every year, we award at least 3 grants to qualified community-based organizations focused on positively impacting those infected and affected by HIV in North Carolina. Since 2008, NCCAF has awarded over $536,105 in grants to to help enhance the direct HIV client services of prevention and care organizations in North Carolina. We seek to support communities as they build and expand their HIV programs through programmatic development, organizational capacity building, and evaluation. We provide assistance with grant writing, fundraising, board development, strategic planning, evaluation, social media marketing, and capacity building. CHISCA: film distribution support for "Thicker Than Blood"
In January 2017, the North Carolina Community AIDS Fund granted $2,500 to support the distribution of the film “Thicker Than Blood” to various locations across North Carolina. The film was produced by Second Glance Productions, in partnership with the North Carolina Department of Health and Human Services, and CHISCA (Community Health Interventions and Sickle Cell Agency, Inc). It premiered on February 7th in recognition of National Black HIV/AIDS Awareness Day and was shown in Charlotte, Durham, Fayetteville, Greenville, Raleigh, and Winston-Salem on February 7thand 8th. The film was made to dispel myths and increase awareness and knowledge about HIV, homosexuality, and the stigma surrounding these issues; and to encourage discussion that addresses the social, cultural and structural barriers faced by HIV+, LGBTQ community members, and even persons who are unaware of their HIV status. Our grant went to CHISCA for them to support the film’s distribution as part of their Safe Spaces Stigma Awareness Campaign. CHISCA has considerable experience working with Black/African-Americans living with HIV and is among the first community-based organizations to actively reach out to, engage, and employ individuals of color living with HIV. In November 2016, NCCAF granted $2,500 to support the Trinity House CLT’s Mind, Body & Spirit (MBS) Program. Trinity House CLT is a community-based organization that was established in 2014 in Charlotte, NC. Its mission is to provide HIV preventive education; to offer compassionate support for those diagnosed and impacted by HIV, whose voices remain unheard and to provide services to the population most at risk of acquiring the virus; creating an environment that embraces the whole individual without judgment and with full acceptance. The primary purpose of the MBS program is to address the optimal health outcomes utilizing the role of faith leaders in the community in changing the course of the epidemic in the fight against HIV and to empower congregations with the knowledge and support about HIV/AIDS. Increased HIV prevention and treatment efforts need to slow and reverse AIDS epidemic with confidential testing to decrease infection rates in the community. The Faith Program will focus on providing leadership on solutions to the faith community by advocating and empowering congregations to become effective voices advocating for HIV/AIDS.